The chairs consist of a square back with four back splats, the top rail, side rails, lower rail and four splats all having a scratch moulded design. This leads down to a solid fruitwood dished seat leading down to tapered legs to the front with a cross stretcher and splay legs to the back. 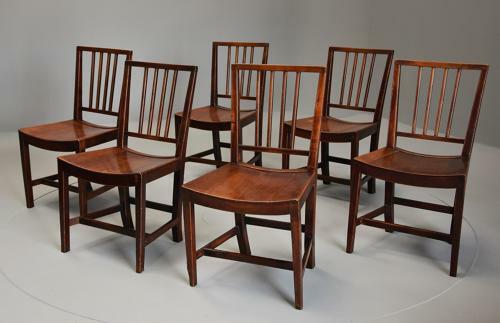 This set of chairs are in excellent, original condition for age, are of stable construction and can go straight into a home.